Winding down in my hotel suite on my last night in Whistler with a personally brewed cup of decaf. Today was a very laidback day. Woke up early and scheduled a last-minute horseback riding session down by Green Lake. I hadn't been on a horse in almost 6 years and there's a lot I had forgotten. I felt like more mingling so I wore my t-shirt with TEXAS on the front. I showed up to the office to get picked up by the shuttle to drive down to the forest and it was controlled chaos in there. There were 2 girls manning the counter and the phones were constantly ringing and as one answered the phone and needed to hand the phone to the other girl, the other girl had to answer a different phone. One of the girls mentioned they were understaffed that morning. I had a temptation to offer my fulltime services. Finally the shuttle came and there were 2 other people - Art and Angie - joining me. It was a short drive down to the stable where the guide was an Australian named Belinda and the assistant was a Brit. Where are all the Canadian employees? We saddled up on our horses. I mounted last and got put on the white unicorn horse Relic, and we were off through the trees... where we were mauled by mosquitoes. Giant mosquitoes. Damn rainforest! I didn't get quite as many as Art in front of me, who I could see often smacking the back of his neck or his scalp. I had opted for the helmet (safety first, kiddies) so had some protection from that, but then I wound up getting them on my face, ear, neck, and THROUGH MY LONG-SLEEVED special cold weather sun protection thermal. Good thing they can't bit through jeans! I heard Art and Angie talking with our guide, and lo and behold, they were from Houston. Crazy. 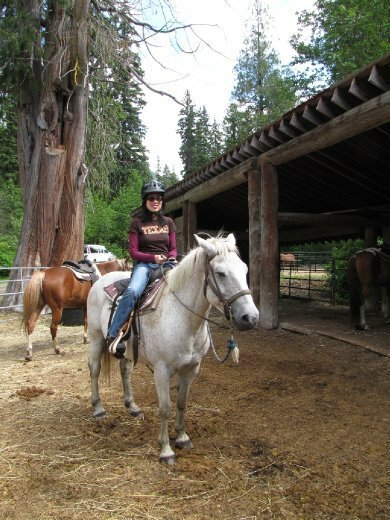 We rode through the trees, crossed a creek, and then rode the horses all the way into the lake. Belinda said the horses were used to the path but sometimes needed "encouragement" i.e. a strong kick to guide them into or across the water. I'm amazed that more people don't get thrown off riding horses. It took me a bit to get used to holding the reins and kicking and preventing Relic from eating random plants on the path, but then it started to feel a bit more natural. Belinda's horse got spooked twice: once when riding back from the lake to the forest and there was a thick branch floating on the water blocking the path, and the other when we were nearing the stables and there was a black bear nearby which a nearby construction worker chased away for us. When I dismounted I could really feel the discomfort in my knees - probably due to incorrect stirrup position - but I think I won't be feeling the full effects until I wake up tomorrow morning. Riding back to Whistler I talked to Art and Angie and he had asked me if I was with their company, because they were on a company trip to Whistler - including their best customers - and there were so many it was hard to keep track. I repeat they were on an ALL-EXPENSE PAID trip to Whistler by their company, from Houston. How do I get in on that? But I told Art I was traveling by myself and he said that was pretty adventurous and I said, "Yeah I'm badass like that. Yep." They got dropped off at their hotel so we wished each other good vacations and then the shuttle driver Michael (who was actually Canadian by his accent) started mentioning other things to do in Whistler. Back in town I got some famous poutine (fries with with cheese curds and chili) from Zog's), and then headed back up to Whistler Mountain since now is officially "summer." It was a much clearer day than it was 2 days ago, but everything up there was still blanketed in snow. Very icy, slippery snow. I stopped by the tube park - where you can get pushed down a snowy hill on a tube - and then climbed some of the snowbanks to get some nice pics but these little hills were very slippery. Going down was quite a task. I kept on finding some sure footing and then some slippery footing every other step so 2/3 of the way down decided just to run for it and if I fell so be it. But all clear! Then I rode over via the Peak 2 Peak gondola to Blackcomb and just like Whistler all the hiking paths were closed there as well. So I treated myself to some passionfruit sorbet gelato from Lucia Gelato. Yum, but then I had trouble finding a freaking trashcan or recycle bin anywhere in the dining hall on Blackcomb. Had to circle the whole floor. Rode the open air Solar Coaster down from Blackcomb and sat next to talkative Ken, who had been taking pictures of the competition up on the glacier. We did the usual introductions - hi, where are you from, what have you been doing today, etc. He told me he helped run a summer camp for kids and I told him I was up in Whistler on vacation by myself planning my own tour/ He said, "That's pretty awesome," and I said, "Yeah I'm badass like that. Yep." He told me he and his family had done a roadtrip down to Houston when he was a kid and they drove all the way from Whistler to Houston. He made some other suggestions of activities I should do in Whistler which I'll file away for my next visit. Then he suggested some good places to eat. I told him that I kept meeting Australians working in Whistler and I was wondering where all the Canadians were and he said, "I'm Canadian!" Totally love the laidback vibe of this place. Back in town I wandered around for a bit more and then decided to head to Sushi Village for dinner. With my trip so far starting in Seattle, there were so many options to order food for takeaway or order at the counter and find outdoor seating or taking it to the beach. So I feel like what was lacking on vacation so far for me was to head to a real sit-down restaurant by myself for some of that good ol' solo-eating awkwardness. I got a seat at the sushi bar and went for the 3-course meal for $25. There were at least 5 options for each course so I thought that was a nice way to set up the menu. It was pretty damn good - each item was excellent - and I was really full afterwards. And get this, the people making the sushi were actually Japanese. Gnarly. This couple from California who were celebrating their 25th anniversary came in a little after me also at the sushi bar so I talked to them for a bit before I left. More of the random conversations I love. I gave my waitress a little extra tip since she was so attentive no doubt because I was by myself. She even patted me on the back at the end of dinner. It's always interesting to gauge people's reactions when I tell them I'm traveling by myself. Guys react more like, "Whoa, that's awesome!" and with girls it's more, "Oh! That's so brave." I can definitely appreciate both. I walked around Whistler Village and Village North a bit later tonight trying to find some Canadian kitsch to bring home. Once I find a really cute stuffed animal dressed like a Royal Canadian Mounted Police officer I am totally buying it. I got one last snack in town, the popular Beavertail (or "Whistler crack" as Ken referred to it) from Zog's. No, it is not actually beaver tail but a sort of fried pastry, kind of like funnel cake, except you can order different coatings on it and it's shaped like, well, a beaver's tail. I got the traditional sugar and cinnamon, and it was yummy. Afterwards I walked around town a few more times. Since it was later there were more young people out heading to the bars and pub crawl. Ah I wish I had thought to come here during college and get started on this whole adventure thing at an earlier age. Tomorrow morning I am heading on the bus back to Vancouver. I haven't decided what to do yet. It looks like there might be rain so that will definitely limit a lot of the outdoor stuff. I think the way I planned this trip was good. You really do need at least 3 days to explore each place and not try to cram everything in. And it makes the length of the trip feel appropriate. I could honestly fly back home tomorrow morning and feel good about my entire trip (as long as I don't have to head back to work on Monday of course). But I'm just gonna take it easy the next 2 days in Vancouver, enjoy the sights, relax and have fun.